Lithograph on wove paper, full margins. 12 x 7 ½ in. 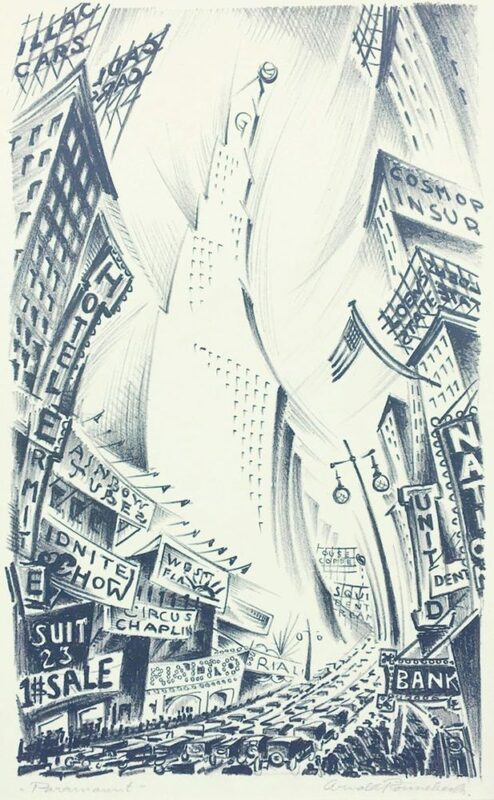 This modernist New York cityscape is a very rare print and Rönnebeck’s most compelling lithograph. After leaving post-war Germany, Rönnebeck emigrated to the U.S. where he found inspiration in the modern metropolis of Manhattan. Alfred Stieglitz soon welcomed him into his circle and the Weyhe Gallery mounted his first solo exhibition in 1925. This lithograph was created when he had the closest personal contact with Stieglitz. Paramount has the expressive dynamism of John Marin’s earlier views of Manhattan, while others, such as Columbus Circle, are more Precisionist and can be compared to Sheeler and Lozowick. It is a dramatic vision of the complexity and chaos of New York, with its overlapping billboards and swaying skyscrapers.